China Is Confronting New U.S. Hostility. But Is It Ready for the Fight? © Adam Dean for The New York Times Workers from Sungrow connect solar panels to custom made buoys on the banks of a lake in a flooded coal mine in Liulong Village, China last year. The Chinese leader, wearing a dark Mao suit, and the American president, in a black tuxedo, stood side by side with arms aloft at the Kennedy Center. Deng Xiaoping and Jimmy Carter smiled broadly as the orchestra played “Getting to Know You,” signaling the dawn of a new era of friendship and cooperation between their two nations. Over the next 40 years, China and the United States built the most important economic relationship in the world and worked together on issues such as regional security, counterterrorism andclimate change . Taking Mr. Deng’s lead, China played the junior partner, if not always deferential then at least soft-pedaling its ambitions and avoiding conflict with the much stronger United States. Now, faster than many in either nation expected, that has all changed. On Monday, the United States will begin taxing $200 billion in imports from China , the biggest round of tariffs to take effect yet in an escalating trade war. President Trump says the measures are necessary to fight an economic model that requires American companies to hand over technology in exchange for market access and provides state subsidies to Chinese competitors. China’s strongman leader, Xi Jinping, presiding over an economy gaining quickly on the United States, has openly challenged American leadership abroad while dashinghopes of any political thaw at home. During this time, both Republicans and Democrats in Washington have turned on Beijing, accusing it of imperialambitions in Asia, aggression in disputedwaters ,persecution of ethnic minorities and unscrupulous trade policies aimed at dominating the industries of the future. In a fundamental shift, the Trump administration has formally described China as a “ revisionist power ” and “ strategic competitor ” in the past year. China has been saying similar things about the United States for even longer. But as relations have deteriorated in recent months, many Chinese are now asking if their country is really prepared to take on the world’s most powerful nation. China has abruptly canceled not only tradetalks that were planned this week in Washington but also military-to-militarytalks scheduled to begin Tuesday. The latter move was made to protest American sanctions imposed last week on a Chinese military department for buying warplanes and missile equipment from Russia. In a sign of Beijing’s growing international influence, though, the Vatican and the Chinese government said Saturday that they had reached a breakthrough agreement on the appointment of Roman Catholic bishops in China, taking a step toward normalizing relations. As the acrimony and rivalry with the United States have intensified, the immediate worry in Beijing is how the Chinese public, accustomed to a fast-expanding economy, will handle the trade war, and what impact it might have on the ruling Communist Party’s overriding concern of domestic stability. The government has sought to project confidence. “Maybe the growth rate will slow 1 percent. We can accept it. That’s not terrible for us,” said Hu Xijin, the editor in chief of The Global Times, a state-run newspaper known for its nationalist tone. He added that Washington would soon realize that its mobile phone and auto manufacturers could not survive without Chinese customers. “As long as our market is expanding economically and growing, China will win the trade war,” he said. Charles S.Y. Liu, a private equity investor who sometimes advises the government, said the Chinese people were prepared to endure a protracted trade conflict. But many others are worried, and some have urged the Chinese leadership to seize the moment and shift the economy even further toward open markets and private enterprise rather than allowing an inefficient state sector to dig in. “A closed approach will lead to a decline in the rate of national competitiveness,” wrote Yan Xuetong, dean of the Institute of International Relations at Tsinghua University, in a recent paper. He warned that China risked returning to the stagnation it suffered in isolation during the Mao era. Other Chinese are arguing that the spike in hostility from the United States could have been avoided if President Xi had continued the policy of “hiding strength, biding time” followed by his predecessors and originally set by Mr. Deng. Mr. Xi instead has flaunted two ambitious programs: the global infrastructure plan known as the Belt and Road Initiative and the effort to dominate advanced industries known as Made in China 2025 , both of which have drawn criticism by the Trump administration. The party has sought to censor criticism of Mr. Xi but there have been glimpses of anxiety online about the potential impact of the trade war as well as anger at the Belt and Road Initiative, which has earmarked hundreds of billions of dollars for overseas projects intended to lift China’s clout abroad. Echoing a popular opinion on social media, a retired economics professor, Sun Wenguang, has argued that it is wrong to spend so much money in other countries given the problems that China faces at home. As he was speaking, the police entered his home and forced him off the phone . Professor Sun’s criticism reflects a broader concern in China about the government’s efforts to win over allies. The subject is important because the United States has long touted its alliances as key to its national strength generally and its ability to counter China’s rise in Asia in particular. China enjoys significant advantages in the region. It is the largest trading partner of almost every country in Asia while President Trump has strained relations with allies around the world. Even Japan, America’s most important ally in Asia, appears to be drifting closer to China as Mr. Trump threatens the nation with tariffs. In a rapprochement between the two Asian rivals, Prime Minister Shinzo Abe is scheduled to travel to Beijing next month, the first visit to China by a Japanese leader since 2011. But some say China is fumbling the opportunity presented by the Trump administration and alienating neighbors by throwing its weight around too aggressively. 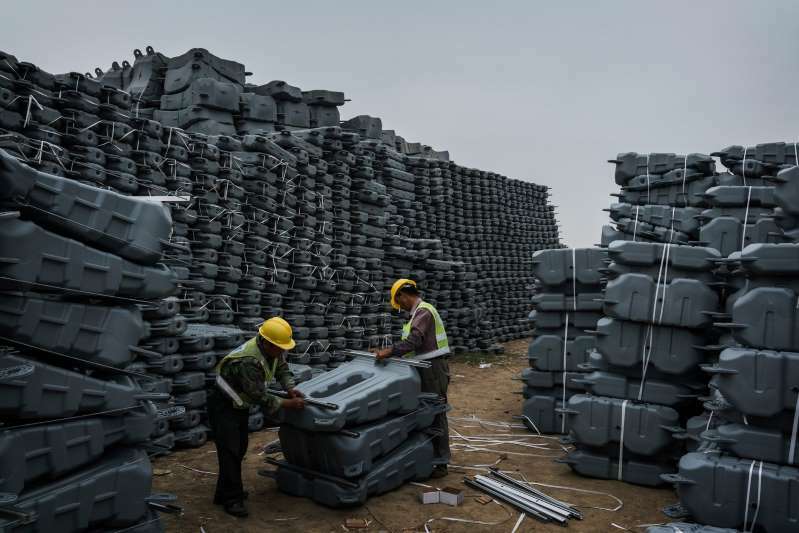 There has been a backlash in several countries against Belt and Road projects that have left governments in deep debt , created few jobs for local residents or damaged the environment. Others have raised an alarm about Chinese efforts to interfere in politics of smaller nations. In an essay that has been widely shared on Chinese social media, a prominent Communist Party scholar warned against national arrogance and overreach , noting the fate of rising powers that succumbed to “recklessness and impetuousness” in the 20th century: Germany, Japan and the Soviet Union. In many ways, the Chinese political elite has been caught off guard by how quickly relations have deteriorated with the United States, which has long been a source of envy and inspiration for many Chinese as well as a leading destination for education and immigration. Chinese scholars often observe that new American presidents usually take a hard line against China but seek cooperation after realizing how the two nations need each other. President Trump has stunned them by defying that pattern. Some Chinese analysts have sought to explain the escalating conflict with the United States by focusing on the personal qualities of the nation’s two leaders. Mr. Trump is a viewed as a fickle, transactional businessman who may retreat after the midterm elections in November. They note he has repeatedly spoken out against China’s trade practices but said little about human rights or military issues. Mr. Xi, on the other hand, is said to have invested too much politically in his signature programs to back down under foreign pressure. Though Beijing devotes tremendous resources to studying the United States, there seems to be little understanding that the hostility against China in Washington is bipartisan and extends beyond trade, and that many frustrated business leaders, once defenders of good ties with China, now favor tougher measures against it as well. Teng Jianqun, director of American studies at the China Institute for International Studies, said the government needed to accept the new reality and tell the Chinese public that the coming struggle could be the beginning of a long fight for the country’s survival as a great power. World - U.S. Daily News: China Is Confronting New U.S. Hostility. But Is It Ready for the Fight?